Help : The Product Category allows you to define different groups of products. These groups can be used in generating Price Lists, defining margins and for easily assigning different accounting parameters for products. Help : The Product Category defines unique groupings of products. Product categories can be used in building price lists. Help : The Accounting Tab defines default accounting parameters. 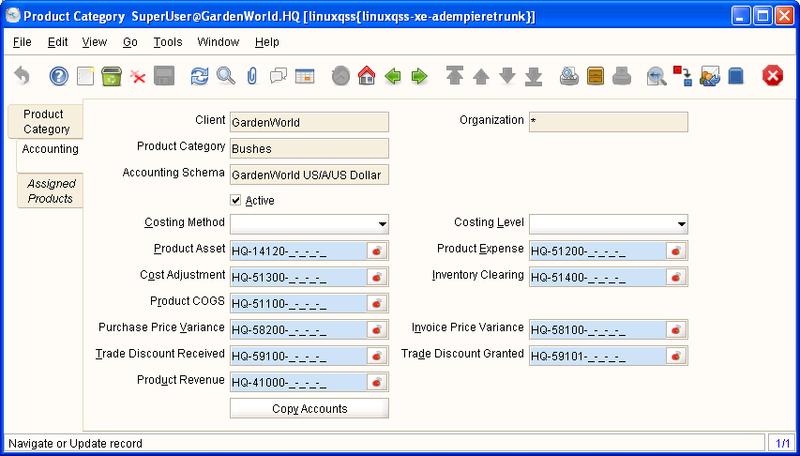 Any product that uses a product category can inherit its default accounting parameters. If the Costing method is not defined, the default costing method of the accounting schema is used. This page was last modified on 14 December 2006, at 14:16.